Loot balance and map layouts are being reworked. PUBG's maps are getting a makeover, starting with the original map, Erangel. The team confirmed the upcoming changes in a statement, with a variety tweaks and new additions, including lots of new compounds, being tested internally. The announcement is slim on details and more a response to recent leaks. Some datamined information popped up on Reddit earlier in the week, suggesting that Erangel was due a lot of new buildings and, presumably, a lot more loot spawning inside them. This handy map that accompanied the leak shows the new buildings in red. It looks like quite a lot of new real estate, and PUBG Corp says the extra compounds aren't the only thing it's testing at the moment. Loot balance and map layout changes appear to be the focus of the update, but the team says it's working on other improvements, too. 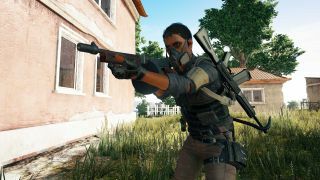 PUBG Corp also points out that leaked images usually don't represent the "entire plan or scope" of a project, so the map we're seeing might change, or look different already. And once it gets in the hands of players for further testing, it could end up looking quite different. Plans for these tests will be shared in the coming weeks, along with more details about the improvements. There have been a few changes to Erangel, and every map, previously, but the scale suggested by the leak seems far greater. The response hasn't exactly been enthusiastic, with some players saying they wanted more loot, not more buildings for them to search, while others are worried the changes will make Erangel lose what makes it distinct from the other maps.